Even with the introduction of many new cables and the ability for older cables to accommodate 100 Gbps technology, the growth of potential capacity has failed to outpace that of lit capacity. As a result, the percentage of capacity that is lit on major routes has begun to slowly rise between 2013 and 2017. 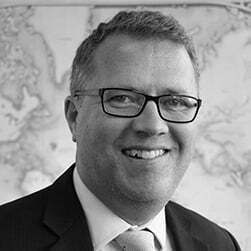 During this period the share of potential capacity that was lit rose from 17 percent to 30 percent on trans-Atlantic cables, while the trans-Pacific route increased from 22 percent to 29 percent. As demand continues to rise, operators of older cables must continue invest in capacity upgrades if they hope to remain competitive. However, as spare capacity dwindles, operators may soon be forced to make tough choices. Cables with a lower-than-average upgrade ceiling will eventually become uncompetitive as annual unit cost of operations and maintenance exceed the annual unit price of capacity on newer cables. Once this threshold is reached, the cable will have reached the end of its economic life, and will be a candidate for retirement. Even when capacity upgrades are feasible, submarine cable system operators must still assess whether or not upgrades on an aging system are economically justified given its remaining potential capacity. Note: Map shows in service and planned cables with a ready-for-service (RFS) data in 2012 or later. 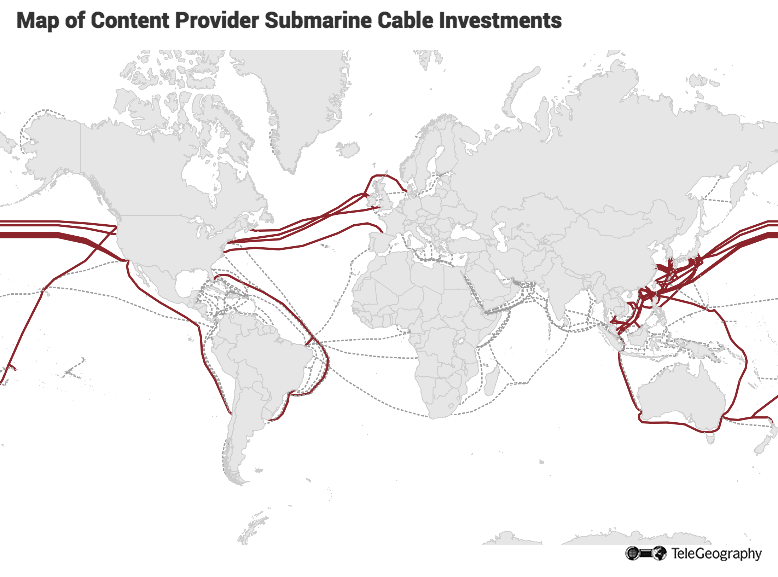 Submarine cables in red are those in which at least one content provider is publicly known to be an investor. Content providers also have capacity on other cables. The rapid expansion of major content providers’ networks has caused a major shift in the global wholesale market. Google, Microsoft, and Facebook are investing in new inter-continental submarine cable systems and purchasing increments of fiber pairs. Although this removes large swaths of bandwidth from the managed wholesale bandwidth market, it also drives scale to establish new submarine cable systems and lower overall unit costs. Many submarine cable business models actually rely on this largesse, allocating fiber and shares thereof to the largest consumers to cover initial investment costs, then selling remaining share of system bandwidth as managed wholesale bandwidth. Global telecom carriers have incentive to make large investments to achieve low unit costs, but disincentive to rely too heavily on deflationary wholesale sales to liquidate bandwidth in excess of their internal requirements. The challenge for a wholesaler is to achieve low unit cost without incurring excess bandwidth that can’t be sold before a new generation of lower-cost supply emerges. Carriers most likely to prevail are those with massive internal demand. 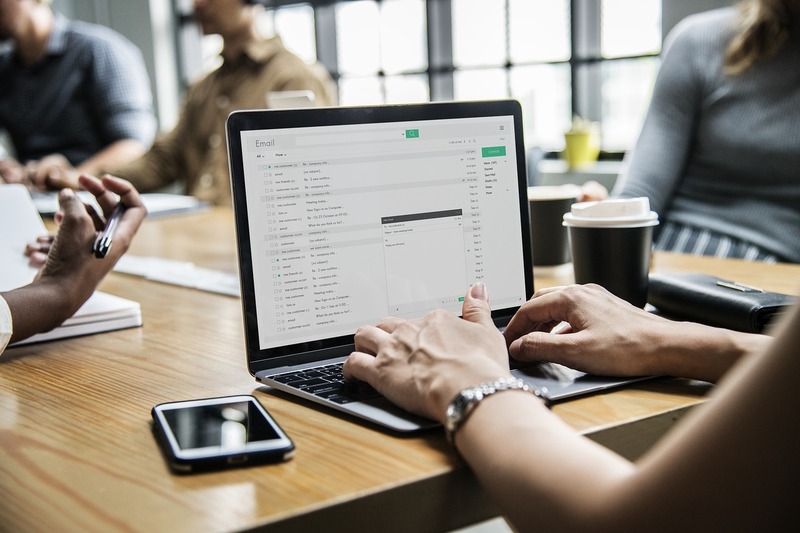 Both content and telco global network operators are reckoning with massive bandwidth demand growth, driven by new applications and greater penetration into emerging markets. The sheer growth in supply will drive lower unit costs for bandwidth. In the face of unrelenting price erosion, the challenge for wholesale operators is to carve out profitable niches where demand trumps competition.